Achilles Tendon Rupture (Video) - Jeffrey H. Berg, M.D. 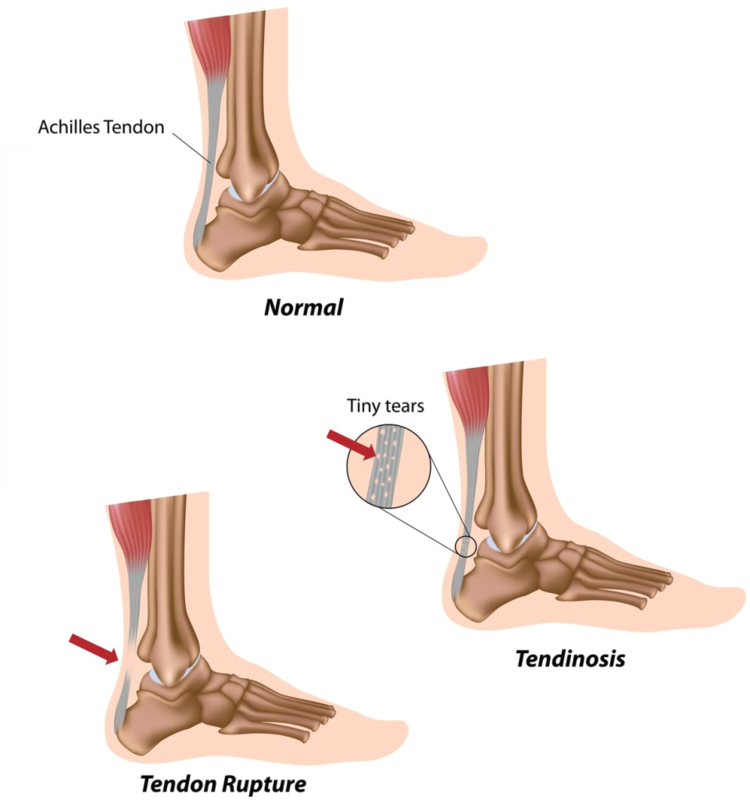 The Achilles tendon is one of the largest, thickest and strongest tendons in the human body. As a result, an Achilles tendon rupture can be a significant and disabling injury. 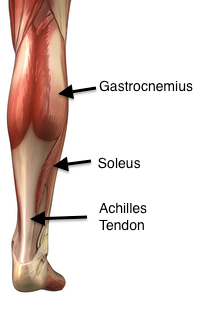 The Achilles tendon is the continuation of the calf muscles (Gastrocnemius, Soleus and often the Plantaris) as they run down the back of the leg and attach to the back of the heel bone (Calcaneus). The Achilles tendon’s primary function is to bring the heel up while pushing the front of the foot down (Plantarflexion). It also aids in preventing the front of the foot from coming up and the heel from collapsing down (Dorsiflexion) too rapidly. These functions are critical for many lower extremity activities such as running, jumping and even walking. Rupture of the Achilles tendon is one of the most common lower extremity injuries. Most often, an Achilles tendon rupture occurs in a middle aged athlete during a jumping, sprinting or cutting activity. They rarely occur in young people, occurring most frequently between the ages of 30 and 50. They are also much more common in males than in females. In the video below, Kobe Bryant tears his left Achilles tendon while cutting. The tear may be complete (across the entire tendon) or partial (only across a portion of the tendon). Most often the injury occurs between 2-3 inches from its insertion on the calcaneus. The tear may also occur near the junction where the calf muscles and the tendon meet . It can also occur at the tendon’s insertion on the heel bone. Finally, it can even, on rare occasions, be through the heel bone itself. When this occurs, a portion of the bone is pulled off with the tendon. No matter the cause, if the Achilles tendon rupture is complete and left untreated, the end of the tendon connected to the calf muscles may retract up the leg. Most often, an Achilles tendon rupture occurs due to a rapid push off by the calf muscles as occurs while jumping or running. It may also be caused by a similarly rapid “collapse” of the foot to a dorsiflexed position such as from landing after a jump. An accumulation of micro-trauma from overuse. Additionally, Fluoroquinolone antibiotics, such as ciprofloxacin (Cipro) and Levofloxacin (Levaquin), and steroids, particularly if the steroids are injected around or into the tendon, can increase the risk of tendon damage and therefore the risk of an Achilles tendon rupture. Finally, and rarely, an Achilles tendon rupture may occur from an injury that penetrates the local skin and cuts the Achilles tendon. These injuries are particularly concerning due to the overlying skin damage as well as the potential for injury to neighboring nerves and blood vessels.